We wake up today to a hung parliament and yet more political instability. A shaky pound has lost more ground against both the US dollar and Euro. Since the EU referendum investors have found shelter from the economic turbulence in leading investment grade Bordeaux wines. Top Bordeaux has shown to move inversely to the pound, presenting an effective hedging opportunity against the faltering currency. Haut Bailly is an Estate on the rise, it is going from strength to strength, with grand investment in the vineyards and winery, precision winemaking and superb terroir. In 2016 they have produced a wine to potentially rival the 100 point scoring 2009. It has been awarded 96-98 points from Neal Martin of the Wine Advocate, which surpasses the 2015. It has also been awarded 98-99 from James sucking who says, ‘Traditional style yet with a modern interpretation’, in this sense it is the very exemplar of the vintage. This is one to speculate on, the 2009 was scored 96-98+ points from barrel and was then awarded 100 points from bottle. Of the 2016 Martin says ‘What a brilliant Haut-Bailly, perhaps the best that I have tasted in almost 20 years of tasting at this estate.’ We are looking at something special, maybe the greatest ever, a future 100 pointer? Today’s release price is £1,000 per case of 12, which represents a 27% euro increase, translating as a 37.5% sterling increase. 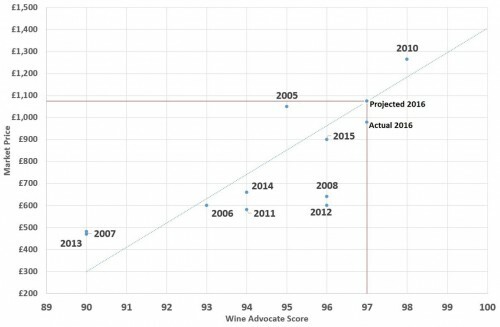 An analysis of the Wine Advocate scores and market pricing of previous Haut Bailly vintages show a strong positive correlation between the two variables (0.82349). This underpins the results and validates the trendline. The 2016 vintage of Haut Bailly was awarded a banded score of 96-98, with a median score of 97 the trendline intersects the y-axis at around £1,090. Today’s release price of £1,000 therefore offers a £100 discount to the expected market price. Upon rescore, should the 2016 vintage achieve the upper end of its banded score, the market price should swing upward to £1,190, offering a further £100 in appreciation. Haut Bailly dates back to the 16th Century and today it is on the rise, established as one of the most sought after wines during en primeur, due to its high scores and low production: 7,500 cases a year. Unlike many wines in Graves they focus exclusively on red wines. The wine is renowned for wonderful purity and concentration of fruit, along with opulent mouthfeel and balance. The 2016 is a buy, a wine that is selling out very quickly and one with real potential upside and staggering value, from bottle we will be looking at leading Bordeaux for £82.50 per bottle for a wine with 98 points, maybe more. In the context of the world’s leading wines, that is exceptional. Their second wine La Parde de Haut Bailly is also worth serious attention and is one of the best second wines of a leading chateau to buy on release. It has been awarded 90-92 points from the Wine Advocate, which priced at £250, or £20.80 a bottle is a stunning buy and an example of what the second wines can do in great vintages, if you buy this, it will reward you for years! The 2016 La Parde de Haut-Bailly is a blend of 47% Merlot, 47% Cabernet Sauvignon and 6% Cabernet Franc, picked between 26 September and 18 October. It has a typical bouquet for the vintage with black fruit, smoke and a touch of bay leaf, a little reserved at first but opening with time. The palate is medium-bodied with fine tannin on the entry. The Merlot imparts a lot of vigor into this Deuxième Vin, which is a feisty little number with great tension on the finish, cedarwood and tobacco lingering on the aftertaste. This comes recommended.